Hello everybody! 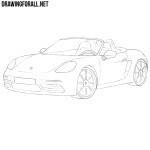 On our site we have shown you how to draw a lot of sport cars – Ferrari, Lamborghini, Porsche. 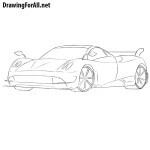 And today we will show you how to draw a Spyker c12 – a sport car of the Netherlands company Spyker Cars. 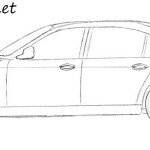 So, let’s start drawing our car. Using light lines we outline the general contours of our Spyker c12. With the help of light lines sketch out the wheel arches and the wheels themselves. So, let’s start adding details. Just draw out the hood and headlights. Use clear and dark lines. Using the same dark and clear lines draw out the radiator grille and emblem in the middle of the bonnet. Pass to the top of our Spyker c12 and draw out the roof with air intakes. Then draw out the windows and mirrors. Further we descend below and draw out a lateral part of our car with a door and details on the side of the car. 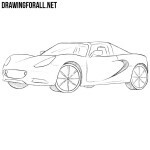 Using clear and smooth lines draw out wheel arches and the wheels themselves. 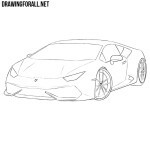 Very simple and fast step – we just need to draw wheel rims. You can also add shadows (as for example in the lesson on how to draw Maserati). So, drawing the lesson on how to draw a Spyker c12 step by step is over. Do not forget to share this drawing lesson and subscribe to us on social networks.